Fine Mess Pottery: Square Plates! Despite their shape, these are wheel-thrown plates. 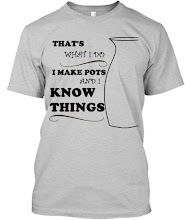 They begin their lives round, as bowls, and then I cut away arcs of the rims to create the square. The contrasting color is trailing slip -- basically a mixture of white clay and water, which must be applied while the piece is still wet. 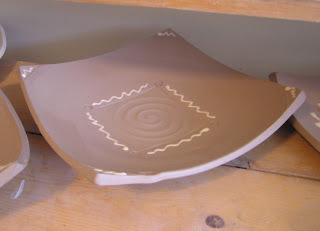 The decoration thus acheived is both visual and tactile, as the slip will maintain its dimension even after firing. 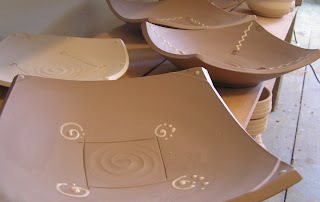 Next glaze is a salt-firing planned for the end of March, and these will be in it. You've got some terrific ideas! Brilliant.